The shopping cart and checkout can be used for payment and delivery of orders to an address in the UK. A discount may be available for orders of 10 or more copies. Please contact us via email or phone +44 (0) 20 8995 3336 for more details. The shopping cart checkout method cannot be used for non-UK orders. For orders to addresses outside the UK, please contact us via email or phone +44 (0) 20 8995 3336 during UK working hours to let us know which country you are in and how many copies you would like. We can then let you know the cost of your order including postage. 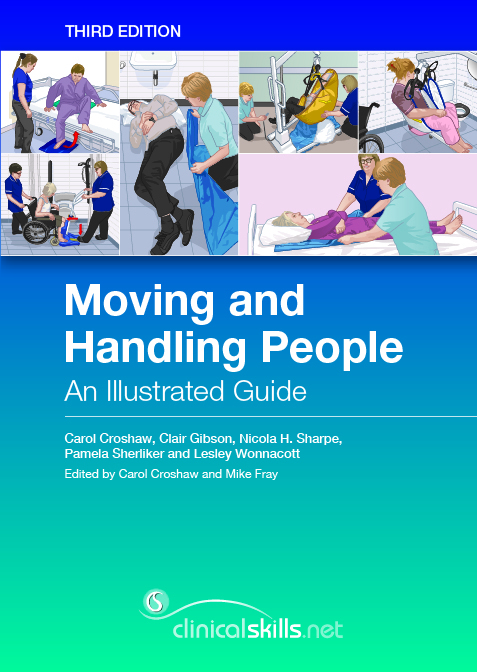 "This useful book...is a 'must' for all carers, handling advisors, those who guide and teach moving and handling and people and professionals who are involved in the provision and use of the relevant equipment." "Moving and Handling People An Illustrated Guide is superb, and that is a view that is shared by everyone I have shown it to." "I purchased this product several months ago and have used it in my working practice to show care staff the pictorial guide to back up my moving and handling plans. I am now going to discuss with my employer to fund access to the Clinical skills web site so the procedures can be downloaded and given as part of the moving and handling plans. Well impressed with the book, best I have come across so far. Staff find pictorial information reassuring and quicker to acknowledge than written information. "This title really is a superb guide and workbook for all healthcare staff looking to improve their people moving skills. The book has some truly wonderful illustrations and clearly defines the moves in an 'easy to understand' way. Highly recommended!!!" Sue is an independent manual handling consultant in health and social care with more than 25 years’ experience in policy development, risk management, training strategies, accident investigation and equipment evaluation. She has contributed to several national working groups who have developed manual handling guidance, including Manual Handling in the Health Services for the Health and Safety Commission (1998) and Guidance on Manual Handling for Chartered Physiotherapists (Chartered Society of Physiotherapy, 2002), and she has been a member of the Royal College of Nursing Advisory Panel on Back Pain in Nurses. She is co-author of Standards in Manual Handling (National Back Exchange, 2010), The Guide to the Handling of People (BackCare, 2005), The Guide to the Handling of Patients (National Back Pain Association, 1997) and Evidence-Based Patient Handling (Routledge, 2003). Sue is a Registered Member of the National Back Exchange (NBE) and currently chairs her local NBE group.